I’m not surprised about the confusion, especially now that companies like Google make one of everything! With that in mind, here’s a quick run-down of what the main phrases mean, and what you can do to spot problems early on. A web browser is a piece of software that displays websites and web pages, and downloads files. When you double-click on an icon on the desktop, or click one in the Start menu, and this opens a new window where you view news stories, email, or Facebook, you’re using a web browser. Exmples: The most popular web browsers today are Mozilla Firefox, Google Chrome, Microsoft’s Internet Explorer and Opera. Threats: Web browsers are pieces of software that you need to download and install on your computer. So you need to get them from a trusted source (use the links above). Many update automatically, so once they’re installed they should keep themselves up to date. Some have better reputations for security than others do – for example Firefox and Chrome have a better reputation for security than Internet Explorer, so many security-conscious web users will never consider Internet Explorer for everyday use. However, the gap isn’t as wide as it once was. A search engine is a tool on a website which brings up a list of results in response to a text search, such as ‘laptop reviews‘. The search engine tries to rank these results in order of relevance, and the factors which help them decide this change daily. 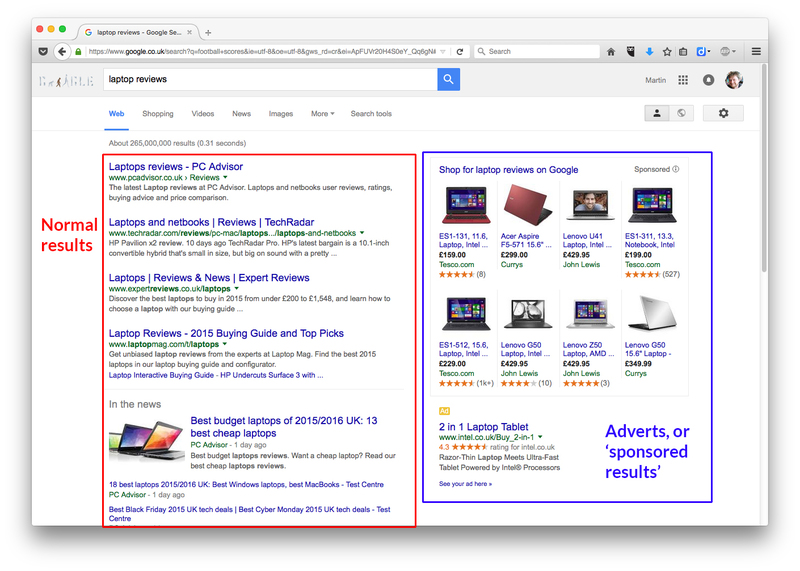 In addition to the search results, the page will usually show adverts related to the search. These adverts have been paid for, and are not guaranteed to be quite as relevant as the real results. Most often, you visit a website in order to use the search box on there. 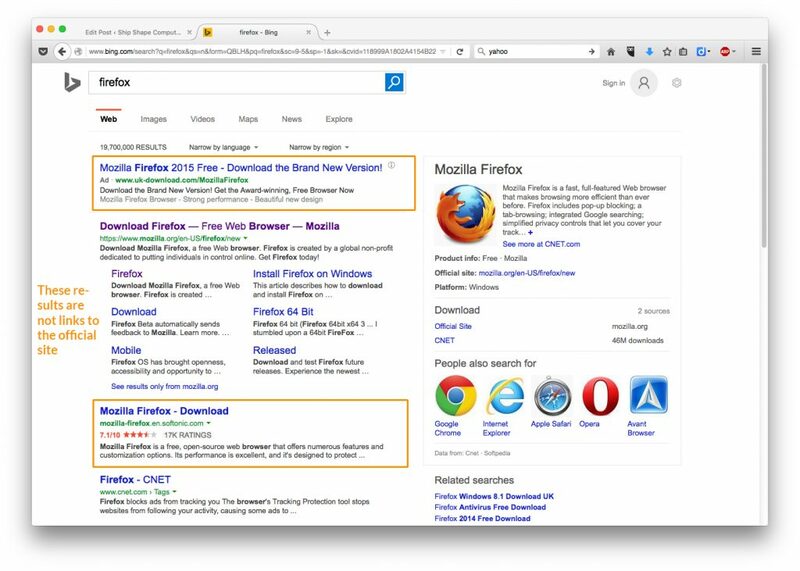 However, many web browsers (see above) have a search engine box included near the top of the screen. Google’s Chrome web browser lets you search by typing your query into the address bar (the box into which you normally type a website’s address, such as “facebook.com”). Examples: The most popular search engines in use today are Google, Bing (from Microsoft), Yahoo! and DuckDuckGo (a privacy-centric search engine, with no adverts). Threats: If you use a well known and trusted search engine there is little direct threat. However, some search engines’ ranking schemes can be ‘gamed’, and malicious websites can appear high in search results for which they’re not relevant, and these sites can download dangerous software to your computer without you realising it. This danger applies especially to the adverts on websites, particularly if they appear to be pretending to be an official site when they’re not. A home page is simply the web page that displays first when you open your web browser. This might be, for convenience sake, a search engine’s page like bing.com. Or it might be a news page, like bbc.co.uk. Or it might be something else altogether, like a recipe website you visit often, or Twitter. Examples: Everyone has their own preference, but any web page can be a home page. 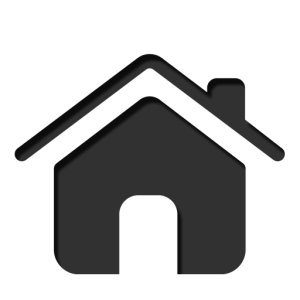 You can often bring up your home page during browsing by clicking on the small house symbol in the toolbar. Threats: The threat from your home page is no more dangerous than it would be if you visited that web page at any other time. However, it’s worth knowing that some dodgy software can, without your permission, change your home page to something less useful. The software usually does this because the new home page will have adverts on it which make money for the software creators. If you notice that your home page has changed, it’s time to call Ship Shape! Well, I hope this little tour of common browsing terms has been useful. Now when you phone for some computer help you’ll be confidently able to tell your Google home page from your Google search engine from your Google Chrome web browser! 😉 Whoever said the Internet was easy?